• Dimensions: 12 1/2 " x 23 1/2"
This is exactly what I've been looking for. Replaces one that was several years old and weathered beyond belief! Was surprised to receive it 3 days after I ordered it, thanks a bunch! We had a similar feeder in the past. We liked it and glad to find another one. Expected the Top to be copper - not plastic a little disappointing for the price I paid. But, the Birds don't seem to care. 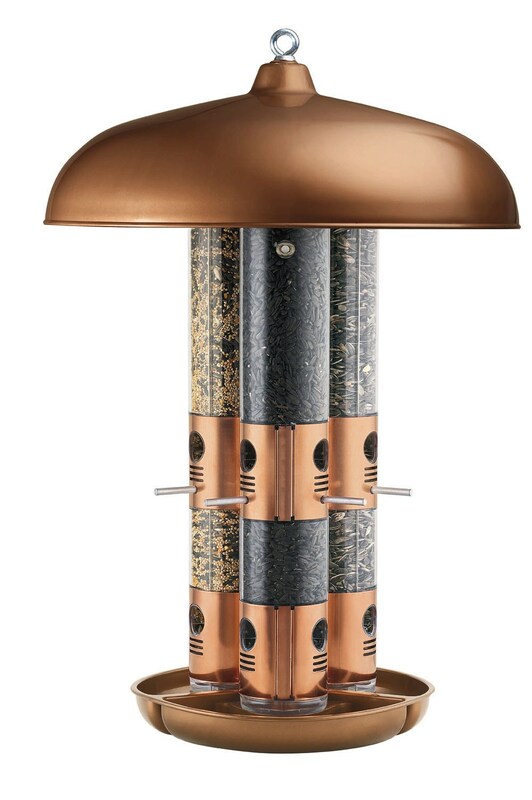 Wow, I couldn't believe how large this feeder was. I just love it! With the huge canopy the birds are able to get out of the weather while they enjoy their feed. I purchased it primarily for finches but the blue jays loved it as well. I like it so much that I changed the size of the hole to only allow the smaller birds to eat from it. It is well worth the money and it looks so nice.